Current Dental Terminology, commonly known as CDT, is published by the American Dental Association (ADA). CDT codes are used for reporting dental services, and CDT 2019 is the official source for up-to-date dental procedure codes. Take the guesswork out of dental coding with CDT 2019. Now published annually! 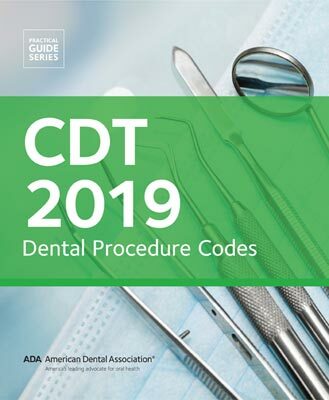 CDT 2019: Dental Procedure Codes from the American Dental Association (ADA) is critical for keeping current records and submitting accurate, effective insurance claims for dental reimbursement. 2019 CDT changes include delivery of noon-opioid drugs for pain management, measuring and documenting glucose levels prior to a procedure, use of translation services, and more. CDT 2019: Dental Procedure Codes is an essential resource for any dental practice, and everyone in the practice knows how important it is to use accurate CDT Codes to avoid rejected claims. But codes are used for more than claims reimbursement. Since each code consistently records a service that was delivered, practitioners can build a thorough history of patient visits and treatment plans. This documentation may also protect practitioners in case questions arise about treatment that was rendered.The ADA provides the first resource available with the new coding information, and the only HIPAA-recognized code set for dentistry.